This article will teach you how to write your very own Slack chatbot that answers simple questions using some basic machine learning tools. Most of the more complex stuff around natural language processing and math behind creating machine learning models is mostly abstracted out, leaving room for us to easily build a finished product in a pretty short amount of time. If you’re looking for a simple and effective way to get a semi-intelligent bot answering questions on Slack fast, then this guide is the one for you. If you want to skip to the finished code, check out the link to the Github repo here or at the end of the post. An installation of NodeJS with the npm package manager. I used Node v10.1.0 with npm v6.1.0 when writing this, but any relatively recent version should work (like v6 and up). A Slack workspace that you have administrative rights in. If you can’t find one, just make a new one. This is the playground where we will be developing and testing out bots capabilities. A code editor. I’m a big fan of VS Code. 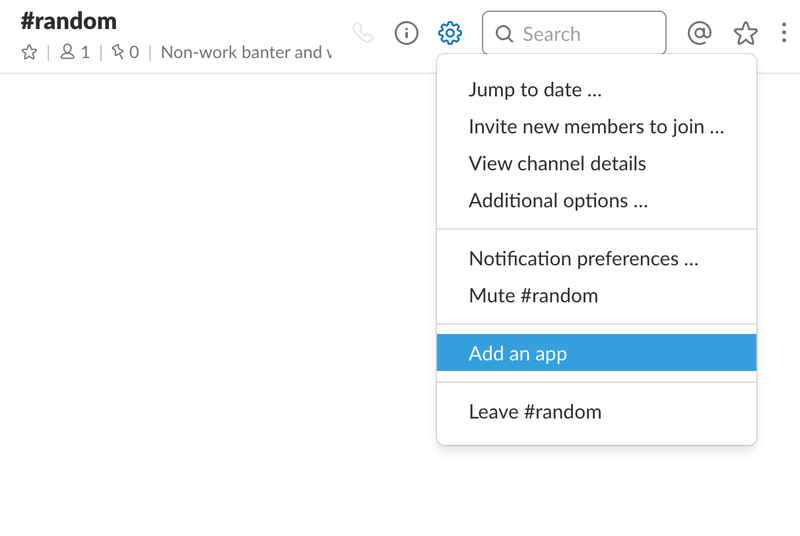 Once you have your Slack workspace open, go to any channel and click on the settings gear icon. We’re going to add an app to our workspace. Search for bot and add the Bots integration. Add the configuration and give it a name you like. This will basically create a special type of user in your workspace you can send messages to, just like any other user. You can change the name and icon of the bot later, but what we need now is the API Token value that get’s generated. BE SURE TO KEEP THIS VALUE SECRET. If someone gets access to this, they get free access to read and post messages in your workspace. Keep that value handy. We’re going to use it soon as we start writing some code. To get something set up, let’s start by getting some boilerplate code out of the way. The following npm commands should get the basics set up. Notice the three libraries we will be using. From there we can start writing some code. Let’s start by making sure we can connect to Slack using the API token we set up previously. Create a file named .env and paste in the following contents replacing the part after the = with your API token. If you are using something like git to maintain your code changes, make sure to add.env to your .gitignore file so you don’t accidentally push it somewhere others can see it! // In this example function the bot will just reply with "got it"
The code above should be simple enough to get your bot up and running. You just need to execute node index.js, and your bot should connect to the Slack API and show up as “Active” in your workspace. If you send it a message, it should reply back with “got it”. You could also modify the code to have the bot respond with whatever you like. Now that we have the basic setup done, we can start to add some intelligence to our bot. Since we’re aiming to have our bot answer questions, we need to take a bit of an open ended approach. Not everyone asks questions the same way. So we need a way to match different questions or phrases coming in with what topic they’re associated with, and then give the appropriate answer. Like I might ask: “What time is it?” while you might ask the same thing by typing “Give me the current time.” Both phrases could be matched to the topic of “current-time,” so we can’t just use strict equality in our code. We are going to employ some machine learning to do this fuzzy matching. "answer": "Hello! I'm a chatbot tasked with answering your questions! `Beep, Boop` :robot_face:"
"answer to the universe and everything"
Put this in a file called trainingData.json in the root of your project. Each group of questions and answer has a label. This is how our bot will try to classify all the input it receives and figure out how to respond. Then we can load our training data using the function like so. Next up is creating what’s called a classifier to consume our training data and create a machine learning model to later make decisions to incoming questions based on what it has learned. Basically, given the set of phrases and responses we provide, the model should be able to extrapolate what response to provide to a phrase it sees as similar to one it has seen before. If you want to learn more about what exactly a classifier is in the context of machine learning, check this out. We’re going to use a library for this. So start by importing the natural library we installed earlier and create a new LogisticRegressionClassifier at the top of you file. Next we need a function for the classifier to be able to ingest training examples. In this case: what questions (phrases) match up to a given answer type (label). * Will add the phrases to the provided classifier under the given label. Now that we have a way for our bot to learn some examples of phrases it might see and classify them appropriately, we need a way for it to handle sending back a proper reply. Since our training data includes an answer for a set of example phrases under a label, we can use it to have the bot send back the same reply. So if our chatbot sees an incoming message that looks like “sup”, based on our training data, it should classify it with the label “self” and send back the answer associated with that label: “Hello! I’m a chatbot tasked with answering your questions! `Beep, Boop` :robot_face:”. Look back at trainingData.json if you need to see that example again. That’s a lot of explaining, let’s see what our function to interpret incoming text looks like. * label should be based on the minConfidence threshold. Notice where we check if guess.value > 0.7. What this says is that if our classifier does not match a label with a confidence of at least 70%, then we say we didn’t find a match. Whatever message came in didn’t match anything we trained our classifier to respond to, so we return null and our ¯\_(ツ)_/¯ response. This is like if someone asked you “What time is it?” you know exactly how to respond because you learned what that question means and how to get the answer. If someone game up and said “Blargen Flostel Bhigba” chances are you never learned how to respond to that, so you’ll probably throw up a ¯\_(ツ)_/¯. So now we need a function to match up that label with the answer that corresponds to that label. Let’s modify our handleMessage function to do this. Instead of sending back the same reply to everything, let’s interpret what the message was, then use the label our classifier generates to provide the appropriate answer based on our training data. If our attempt to interpret the message didn’t yield a result, the bot can simply reply that it didn’t understand. * object to reply and the message that was provided as input. * the message was not able to be understood. Last up, let’s bring it all together by calling all the functions we just created and the existing ones we have to get our bot up and running. Notice the code at the bottom is basically the same, except we’ve modified the handleMessage function to be a bit smarter this time around. Let’s see what our bot can do! Go ahead and run node index.js in your console in the root of your project directory. If all goes to plan, you should see your bot injecting your training data examples and start up waiting for input. Head back to Slack and try to ask it to introduce itself! Ask it something else you trained it to respond to! If you ask it something it hasn’t been trained for, expect an appropriate response. But you could always train the bot to respond to that by adding it to your training data! Just create a new label and add some questions and an answer you’d like the bot to respond with. I was going to write some extra stuff about how to deploy the bot somewhere and potential ideas for enhancements, but this post has already become longer than I anticipated. I plan to get those thoughts into a follow up post and link it here. In the meanwhile, please comment with your feedback. Was following along easy enough? What skill level are you at with Node development or ML concepts? Also don’t forget to share the cool bots you create!